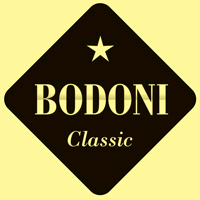 The Bodoni™ font is a well-known serif typeface series that has had a long history of interpretations by many design houses. The various font styles begin with Bodoni’s original Didone modern font in the late 1700s through to ATF’s American Revival in the early 1900s and into the digital age. The original design had a bold look with contrasting strokes and an upper case that was a bit more condensed then its stylish influence Baskerville®. The unbracketed serifs and even geometric styling has made this a popular font seen in almost every kind of typesetting situation, but particularly well suited for title fonts and logos. It was first designed by Giambattisa Bodoni in 1798 and is generally considered a “transitional” font type. Bodoni was a prolific type font designer and this particular font was highly influenced by the work of John Baskerville, a designer whose work Bodoni followed. The font, with its highly recognizable centered “Q” tail and slight hook in the “J”, was widely accepted by printers and can be seen in a broad variety of publications and uses since the late 1700s. American Type Founders came out with a variant designed by Morris Fuller in 1909, followed by an italic and book version in 1910, italic and bold+italic in 1911, a bold shaded version in 1912 and shaded initials in 1914. These were followed by subsequent versions in 1915 through 1926 to create a full family of fifteen font variations on Bodoni’s original font style. Monotype came out with two italic variations in 1911 and 1930 and two bold versions in the mid-1930s. At around the same time Robert Wiebking at Ludlow designed a light and italic variation along with an italic called True-Cut Bodoni™ + Italic that he based on the originals at the Newberry Library. Wiebking went on to design a bold variation of this font in 1930. R. Hunter Middleton, also at Ludlow, was to design the Bodoni Modern™, Bodoni Classic™ and Bodoni Italic™ after ten years of research that are still today considered the most faithful redesign of Bodoni’s original roman design. Other type foundries that were to offer variations of Bodoni are the Damon Type Foundry’s Bartlet© , Haas Type Foundry which produced a version licensed to Stemple, Amsterdam Type Foundry and Berthold and the Bauer Type Foundry . Heinrich Jost created the Bauer version in 1926 to include a Roman, Title, Italic, Bold and Italic Bold weight. Because Bodoni has long been considered a standard font it has always been widely available in cold type versions and was reintroduced in a variety of digital variations. The late 1980s collaboration of Massimo Vignelli and Tom Carnase on WTC Our Bodoni™ for World Typeface Corporation is a good example of one of the hundreds of modern versions of Bodoni. It was designed to set well with Helvetica because Vignelli preferred using only those two typefaces. One of the earlier publications using Bodoni was Dante’s La Vita Nuova in 1925. A good example of the design capabilities is Chauncey H. Griffin’s Poster Bodoni™ used in neon signs and most recognizably in the poster for the movie and play Mama Mia! as well as the movie poster for Black Dahlia. The 1950 Museum of Modern Art publication What is Modern Design? was designed by leading modern designer Jack Dunbar and features Bodoni as its title font. In advertising Bodoni has been used in many logos because of its classic style including Guerlain, Elizabeth Arden, Giorgio Armani and the classic “CK” for Calvin Klein. In magazine publications such icons as Harper’s Bazzar and the classic architecture magazine Metropolis both use Bodoni as their basic text font. In addition Elle magazine ahs used it for logo and titles. Variations on the Bodoni font have appeared in many places in the entertainment media including the cover slip for the single Britney Spears 3 was Bodoni Stn-Poster Italic as well as the show logo for The News Hour with Jim Lehr which is in Bodoni TS-Demi Bold.